I can hear heads thumping… Please, just show me pictures, don’t be a boor and bore me with gear talk. That disclaimer out-of-the-way — GEAR!!! 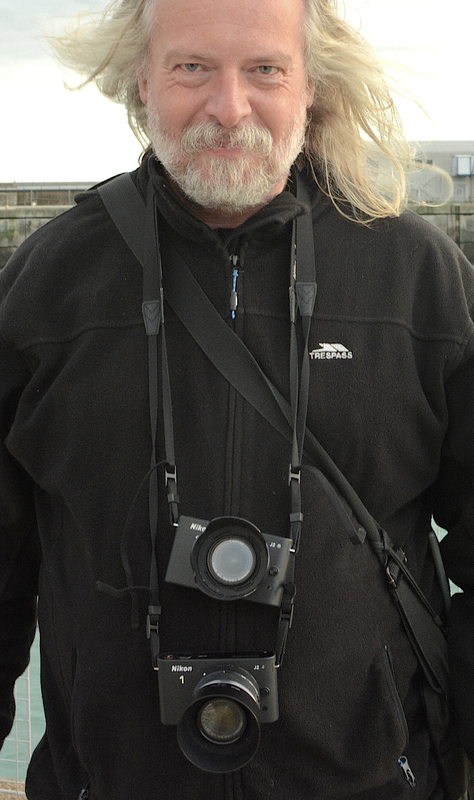 On one of his Dover beach strolls Paul met fellow photographer, Edwin (pictured above), who is enamored with the Nikon One system of little mirrorless cameras. This picture reminded me of the days when photojournalists would routinely be draped with three or four camera bodies — each with a different lens. These are commonly refered to as “primes” now. (I am a pre-zoom guy and it was rare to see a zoom carried by a professional photographer in the 1970-1980s). My last kit in the newspaper days consisted of three Leica R bodies with five lenses at hand – 19, 35, 90, 180, 400. and as need arose a Lecia M4 with 50mm. But now, as I have explained in earlier articles, Paul and I shoot with DSLRs and zooms. He opts for APS-C cameras, primarily lightweight Nikon D5X00 series, with “super zooms” for convenience i.e. 10-24, 18-200, 55-300. He arguments these with a 35mm f 1.8 Nikkor “prime.’ I go with a combo of Nikon D610 and D300 and seven Nikkor lenses from 16- 300. Edwin with the Nikon One system has an “off-the shelf” Nikkor range from 18- 810 with the current stash of about 15 lenses — sounds gear yummy — but rather limited with only three primes and mostly consumer-grade medium range zooms. One caveat for legacy Nikon users — there is the FT1 mount adapter, that supports autofocus and vibration reduction, for 80+ Nikon lenses (with a 2.7x crop factor). Anyway — warned you this was tedious — Paul wondered about image Quality aka IQ of this system compared to the mirrorless competition – Sony, Panasonic, et al. Pixel peepers can look this up at dxomark. We daydreamed that it would be fun in a dorkie kind of way to drape oursleves with four Nikon One bodies with 6.7-13mm, 70-300mm, 32mm f/1.2, 18.5mm f/1.8 lenses. Prepared for any photo-j exigency. The conclusion was that we have to “keep it real man” and think in terms of the plane of focus behind the camera. If you don’t have a vision (and know your audience) all the gear and pixels in the world will still produce a head-thumping snooze.